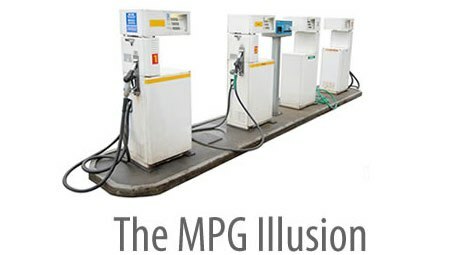 How does MPG translate to gas use and gas cost? How do different 2009 cars compare? See our GPM ("gallons per mile") calculator here: http://www.gpmcalculator.com. The General Motors website offers a kind of GPM calculator that allows you to compare GM vehicles on MPG, carbon emissions, gas cost, etc. It can be tailored to your choice of driving distance, driving mix (city/highway), and expected gas prices. In a very interesting design choice, GM describes gas consumption not as gallons of gasoline, but as "barrels of fuel." I assume this is barrels of oil. In a new article (Burson, Larrick, & Lynch, 2009, Psychological Science), my co-authors and I have shown that people are more sensitive to differences expressed on "expanded" scales (e.g., 48 vs. 36 inches) than on "contracted" scales (e.g., 4 vs 3 feet). In this case, "gallons" is an expanded scale (and the one we're used to), while "barrels" is a contracted (and unfamiliar) scale. Why use a "contracted" scale such as barrels? General Motors' stock ticker abbreviation is GPM.